The middle class has apparently shrunk to an all-time low. Indeed, a recent study shows that the richest Americans captured more than 100% of all recent income gains. And see this. And the details of poverty in the U.S. are shocking. Social mobility – the ability to go “from rags to riches” – is no longer an American quality. Indeed, many parts of the world have now surpassed the U.S. in social mobility. 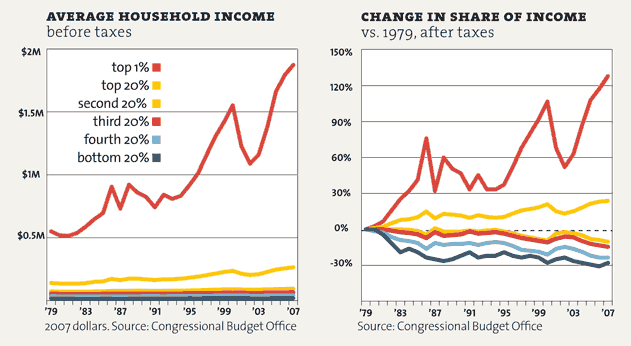 We’ve previously reported that income inequality has increased more under Obama than under Bush. 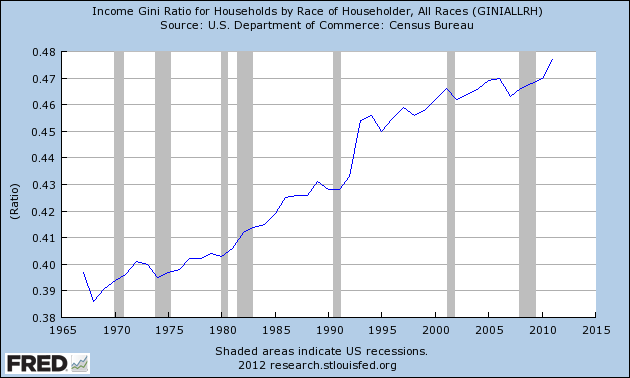 But we have to go much farther back in history to find inequality as high as in American today. Specifically, inequality in America today is worse than it was in Gilded Age America, modern Egypt, Tunisia or Yemen, many banana republics in Latin America, and worse than experienced by slaves in 1774 colonial America. It is twice as bad as in ancient Rome – which was built on slave labor. Jim Quinn has previously documented the growing gap in how the retailers catering to the wealthy are doing, versus the stores selling to the average American. So have Bloomberg and Zero Hedge. This tale of two retailer groups is laden with implications. It not only shows that the so-called recovery is tenuous and highly skewed to a small slice of the population at the top of the economic ladder, but also that statist economic intervention has now become wildly dysfunctional. Largely based on opulence at the top, Wall Street brays that economic recovery is under way even as the Main Street economy flounders. Renowned behavioral economist Dan Ariely (Duke University) and Michael I. Norton (Harvard Business School) recently demonstrated that everyone – including conservatives – thinks there should be more equality. Taken as a whole, the results suggest to us that there is much more agreement than disagreement about wealth inequality. Across differences in wealth, income, education, political affiliation and fiscal conservatism, the vast majority of people (89%) preferred distributions of wealth significantly more equal than the current wealth spread in the United States. In fact, only 12 people out of 849 favored the US distribution. The media portrays huge policy divisions about redistribution and inequality – no doubt differences in ideology exist, but we think there may be more of a consensus on what’s fair than people realize. Why Do We Have So Much Inequality? If runaway inequality is so harmful to our economy – and if most people don’t want so much inequality – why is inequality becoming more and more extreme? The big banks literally own the Federal Reserve. And they own Washington D.C. politicians, lock stock and barrel. See this, this, this and this. Indeed, not only is the chief law enforcement official in the country refusing to prosecute the big criminals, but he’s working to get the already-jailed ones sprung. The central banking branch of the state remains hostage to Wall Street speculators who threaten a hissy fit sell-off unless they are juiced again and again. Monetary policy has thus become an engine of reverse Robin Hood redistribution; it flails about implementing quasi-Keynesian demand–pumping theories that punish Main Street savers, workers, and businessmen while creating endless opportunities, as shown below, for speculative gain in the Wall Street casino. These futile stimulus actions are demanded and promoted by the crony capitalist lobbies which slipstream on whatever dispensations as can be mustered. At the end of the day, the state labors mightily, yet only produces recovery for the 1 percent. He’s right. Quantitative easing doesn’t help Main Street or the average American. It only helps big banks, giant corporations, and big investors. And by causing food and gas prices skyrocket, it takes a bigger bite out of the little guy’s paycheck, and thus makes the poor even poorer. Another reason why the super-rich are becoming much richer and everyone else poorer is that Obama is prosecuting virtually no financial criminals. Indeed, crony capitalism has gotten even worse under Obama. 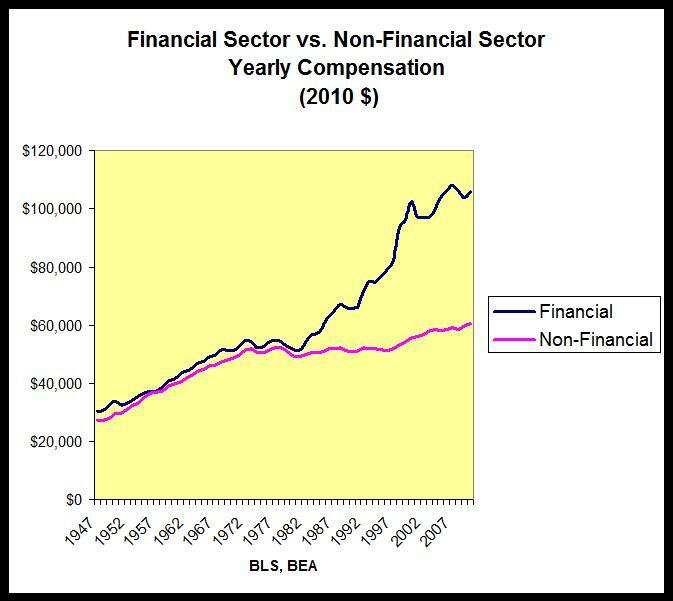 As we documented in 2009, the bailout money is just going to line the pockets of the wealthy, instead of helping to stabilize the economy or even the companies receiving the bailouts. The bottom line is that the super-elite have destroyed the American economy and the American system of government. We no longer have a capitalist system within a democratic republic. Instead, we have fascism, communist style socialism, kleptocracy, oligarchy or banana republic style corruption. We noted above that inequality in America today is worse than in modern Egypt, Tunisia or Yemen, many banana republics in Latin America, worse than experienced by slaves in 1774 colonial America, and much worse than in ancient Rome – which was built on slave labor. Arguably, we have lost almost as many liberties as people in those systems. There are two systems of justice in America … one for the big banks and other fatcats, and one for everyone else. And see this. Indeed, the loss of economic power and the loss of freedom often go hand-in-hand. A strong rule of law is the main determinant of prosperity. On the other hand, failure to prosecute fraud by the white collar elite is destroying our prosperity. America has suffered a catastrophic loss of both legal – and economic – freedom. Inequality, in both senses of the word – both economic and access to liberty and justice – is skyrocketing to historic levels.